Charlotte Decock earned a B.Sc. and M.Sc. in Environmental Engineering from Ghent University in Belgium, and a Ph.D. in Soils and Biogeochemistry at the university of California, Davis. Her doctoral research focused on nitrogen cycling and emissions of the potent greenhouse gas nitrous oxide (N2O) from agroecosystems in a changing global environment. She conducted consulting work on the quantification of greenhouse gas emissions reductions from agriculture for a California-based carbon offset program, and contributed to various reviews and meta-studies related to the mitigation of N2O emissions from soil. As a postdoctoral researcher at ETH Zurich in Switzerland, she studied effects of plant roots on carbon and nitrogen cycling, with the aim of identifying root traits that could improve soil health and nutrient use efficiency. She also led and contributed to projects on the effect of water and nutrient management on soil fertility, nitrate leaching, and greenhouse gas emissions in rice cropping systems in Northern Italy and India. The project in India placed explicit emphasis on the farmers’ perception and feasibility of proposed management practices at the farm scale, through farmers’ surveys and participatory research. The role and importance of farmers’ participation in agricultural research and extension was also a crucial focus of the course entitled ‘Agroecologists without Borders’, which she taught at ETH Zurich from 2013-2016. 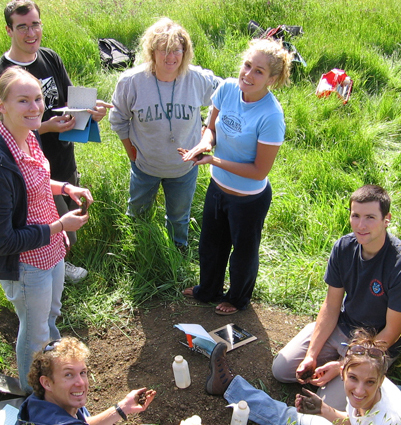 At Cal Poly, Charlotte Decock teaches Soil Health and Plant Nutrition (SS 221), Soil-Plant Relationships (SS 322) and Introductory Soil Science (SS 121). SS 221 covers many of the learning objectives of the Western Region Certified Crop Advisors (CCA) program, preparing interested students for the professional certification. 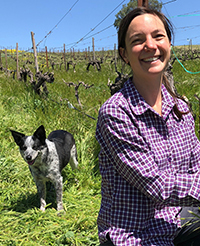 Charlotte Decock’s research at Cal Poly focuses on soil health and nutrient cycling in California specialty crops, with special attention to strawberry and leafy green cultivation. She is interested in the evaluation of novel indicators for the assessments of soil health and nutrient availability in California cropping systems. Her work on carbon and nutrient cycling aims to contribute to the development and assessment of soil and nutrient management practices that protect water and air resources, while maintaining agronomic productivity and economic viability. The strengths of the instructor is her knowledge and enthusiasm about the course material. It was Dr. Decock’s first quarter teaching but she was very friendly, clearly enthusiastic and knowledgeable about the subject matter. A strength of the instructor was answering questions in a clear manner and further explaining if needed. In lab, it was nice to learn hands on. The [course] material was very interesting and applicable to field production of crops. Ditzler, L; Breland, T.A. ; Francis, C.; Chakraborty, M.; Singh, D.K; Srivastava, A.; Eyhorn, F.; Groot, J.C.J. Six, J.; Decock, C. In review. Identifying viable nutrient management interventions at the farm level: the case of smallholder organic Basmati rice production in Uttarakhand, India. Denk, T.R. ; Mohn, J.; Decock, C.; Lewicka-Szczebak, D.; Harris, E.; Butterbach-Bahl, K.; Kiese, R.; Wolf, B. (2017) The nitrogen cycle: A review of isotope effects and isotope modeling approaches. Soil Biology and Biochemistry 105, 121-137. Mohn, J.; Gutjahr, W.; Toyoda, S.; Harris, E.; Ibraim, E.; Geilmann, H.; Schleppi, P.; Kuhn, T.; Lehmann, M.F. ; Decock, C.; Werner, R.A.; Yoshida, N.; Brand, W.A. (2016) Reassessment of the NH4NO3 thermal decomposition technique for calibration of the N2O isotopic composition. Rapid Communications in Mass Spectrometry 30, 2487-2496. Wolf, B.; Merbold, L.; Decock, C.; Tuzson, B.; Harris, E.; Six, J.; Emmenegger, L.; Mohn, J. (2015) First on-line isotopic characterization of N2O above intensively managed grassland. Biogeosciences 12, 2517-2531. Decock, C. (2014) Mitigating Nitrous Oxide Emissions from Corn Cropping Systems in the Midwestern U.S.: Potential and Data Gaps. Environmental Science & Technology 48: 4247–4256. Decock, C. and Six, J. (2013) On the potential of d18O and d 15N to assess N2O reduction to N2 in soil. European Journal of Soil Science 64: 610-620. Kennedy, T.; Decock, C. and Six, J. (2013) Assessing drivers of N2O production in California tomato cropping systems. Science of the Total Environment 465: 36-47. Decock, C., Six, J. (2013) How reliable is the intramolecular distribution of 15N in N2O to source partition N2O emitted from soil? Soil Biology & Biochemistry 65: 114-127. Decock, C. and J. Six (2013) An assessment of N-cycling and sources of N2O during a simulated rain event using natural abundance 15N. Agriculture, Ecosystems & Environment 165: 141-150. Decock, C.; Chung, H.; Venterea, R.: Gray, S.B. ; Leakey, D.B. ; Six, J (2012) Elevated CO2 and O3 modify N turnover rates, but not N2O emissions in a soybean agroecosystem, Soil Biology & Biochemistry 51: 104-114. Decock, C.; Denef, K.; Bode, S.; Six, J. and Boeckx, P. (2009) Critical assessment of the applicability of gas chromatography-combustion-isotope ratio mass spectrometry to determine amino sugar dynamics in soil. Rapid Communications in Mass Spectrometry 23. 1201-1211.